The firm is an actor in the capitalist economy, and a stage on which interactions among the firm’s employees, managers, and owners are played out. Hiring labour is different from buying other goods and services, and the contract between the employer and the employee is incomplete. It does not cover what the employer really cares about, which is how hard and well the employee works. Incomplete contracts arise when important information, such as the employee’s effort, is asymmetric or non-verifiable. In economics, employment is modelled as a principal (the employer) interacting with an agent (the employee). The principal–agent model can be used to study other relationships with incomplete contracts, such as the interaction between a lender and a borrower. Firms do not pay the lowest wages possible. They set wages so that employees earn economic rents, to motivate them to work effectively, and stay with the firm. Working together in firms brings mutual gains: profit for owners, and economic rents for managers and employees. But rents also lead to involuntary unemployment in the economy. Apple’s iPhone and iPad are iconic American hi-tech products, yet neither is assembled in the US. Until 2011 a single company, Foxconn, produced every iPhone and iPad in factories in China, mainly so that Apple could take advantage of lower costs, including wages. The components of the iPhone and iPad for the most part do not come from China, but are sourced from around the world. Components such as the flash memory, display module, and touch screen are made by a number of different companies including Toshiba and Sharp in Japan. The microprocessor is made by Samsung in South Korea and other components, by Infineon in Germany. Like other firms, Apple makes profits by finding the supplier that can provide inputs at the lowest cost, whether the input is a component or labour, wherever in the world that supplier may be located. The cost of assembling the components into the final product in China is small—making up only 4% of the total cost—compared to the cost of components sourced from high-wage economies such as Germany and Japan. Almost half of Apple’s employees in the US sell Apple products rather than making them, while firms compete on a global scale to win the lucrative business of supplying Apple with its components. The cost of producing the iPhone is far lower than the price Apple charges: in 2016, a 32Gb iPhone 7 cost $224.80 to manufacture. Its price in the US was $649. Apple is not alone in outsourcing (or offshoring) production to countries that are not the main market for the goods produced. In most manufacturing industries, firms based in rich countries have transferred a significant proportion of production, which was previously done by local employees, to poorer countries where wages are lower. But Apple and other firms are looking for more than cheap labour. Wages in some of Apple’s source countries such as Germany are higher than in the US. Other industries, particularly garment manufacturing, have relocated primarily to low-wage economies. More than 97% of apparel and 98% of footwear sold in the US by American brands and retailers is made overseas. China, Bangladesh, Cambodia, Indonesia, and Vietnam are now among the world’s main exporters of textiles and clothing. At the time of the Industrial Revolution, the world’s largest exporter was Britain. Also, in developing countries, additional business costs such as health and safety rules are far lower, and environmental regulations are often less strict. Apple, Samsung, and Toshiba are business organizations called firms. Not everyone is employed in a firm. For example, many farmers, carpenters, software developers or personal trainers work independently, as neither employee nor employer. While some people work for governments and not-for-profit organizations, the majority of people in rich nations make their living by working in a firm. Firms are major actors in the economy and we will use this and the next unit to explain how they work. A firm is often referred to as if it were a person: we talk about ‘the price Apple charges’. But while firms are actors—and in some legal systems are treated as if they were individuals—firms are also the stage on which the people who make up the firm (employees, managers, and owners) act out their sometimes common but sometimes competing interests. 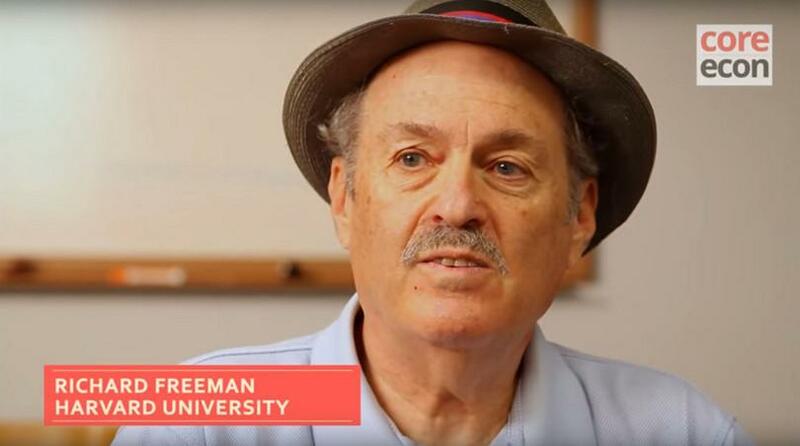 In our ‘Economist in action’ video Richard Freeman, an economist who specializes in labour markets, explains some of the consequences of outsourcing for these actors. Work is how people produce their livelihoods. In deciding how much time to spend working, people face a trade-off between free time and the goods that they can produce, or the wage income that they can earn. Production, wages, and living standards have grown through the innovation and adoption of new technologies by firms. If a production process requires labour to be combined with other inputs—like Angela’s labour and Bruno’s land—then a voluntary contract between the owners of those inputs can determine how the surplus from their interaction will be shared between the two parties, depending on their bargaining power. There are potential gains (to all concerned) from individuals specializing in tasks for which they have a comparative advantage. The division of labour may be coordinated through market exchange. In Unit 1, specialization in grain and apples was coordinated through buying and selling grain and apples. In Unit 5, the interaction between Angela and Bruno was coordinated by a contract trading the use of land for a share of the crop. Sometimes, however, people need to work together to produce something that will benefit all of them, and their success will depend on their preferences and strategies to discourage free riding. Another way that work may be coordinated and combined with other inputs is by organization within a firm. The firms in Unit 2 produced cloth, deciding how much coal to buy and how many workers to employ. We illustrated each of these conclusions using models that illuminate some aspects of the economy, while setting aside others. In Unit 2, we did not consider how the length of the working day was determined while the economy was growing. In Unit 3, we did not model how the wage or the marginal rate of transformation of free time into goods was determined when we analysed a decision on working hours. In Unit 2 we told a story of conflicting interests over wages, but we did not model strategic interaction and bargaining until Units 4 and 5. And in Unit 5 we used the story of just two (imaginary) people called Bruno and Angela to model how bargaining may affect the Pareto efficiency and fairness of allocations. In this unit, we study how, in the modern capitalist economy, the coordination of labour takes place within firms. We model how wages are determined when there are conflicts of interest between employers and employees, and look at what this means for the sharing of the mutual gains that arise from cooperation in a firm. In Unit 7, we look at the firm as an actor in its relationship with other firms and with its customers. The economy is made up of people doing different things, for example producing Apple display modules or making clothing for export. Producing display modules also involves many distinct tasks, done by different employees within Toshiba or Sharp, the companies that make them for Apple. Setting aside the work done in families, in a capitalist economy, the division of labour is coordinated in two major ways: firms and markets. Among the institutions of modern capitalist economies, the firm rivals the government in importance. John Micklethwait and Adrian Wooldridge explain how this happened. John Micklethwait and Adrian Wooldridge. 2003. The Company: A Short History of a Revolutionary Idea. New York, NY: Modern Library. Why do firms work the way they do? For example, why do the owners of the firm hire the workers, rather than the other way around? Randall Kroszner and Louis Putterman summarize this field of economics. Randall S. Kroszner and Louis Putterman (editors). 2009. The Economic Nature of the Firm: A Reader. Cambridge: Cambridge University Press. Through firms, the components of goods are produced by different people in different departments of the firm, and assembled to produce the finished shirt or iPhone. Or components produced by groups of workers in different firms may be brought together through market interactions between firms. By buying and selling goods on markets, the finished iPhone gets from the producer into the pocket of the consumer, and the American Apparel shirt ends up on somebody’s back. So in this unit we study firms. In the units to follow, we study markets. Herbert Simon, an economist, used the view from Mars to explain why it is important to study both. Imagine a visitor approaching Earth from Mars, Herbert ‘Herb’ Simon (1916–2001) urged his readers. Looking at Earth through a telescope that revealed social structure, what would our visitor see? Companies might appear as green fields, he suggested, divisions and departments as faint contours within. Connecting these fields, red lines of buying and selling. Within these fields, blue lines of authority, connecting boss and employee, foreman and assembly-worker, mentor and mentee. Trained as a political scientist, Simon’s desire to understand society led him to study both institutions and the human mind—to open the ‘black box’ of motivations that economists had come to take for granted. 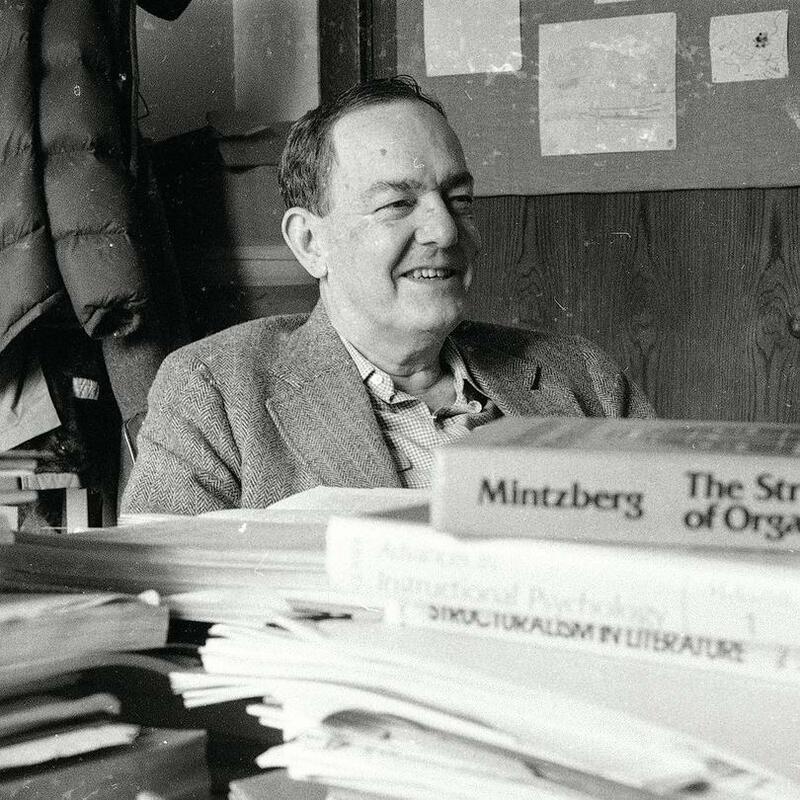 He was celebrated in departments of computer science, psychology, and, of course, economics, for which he won the Nobel Prize in 1978. A firm, he pointed out, is not simply an agent, shifting to match supply and demand. It is composed of individuals, whose needs and desires might conflict. In what ways could these differences be resolved? Simon asked, when would an individual shift from contract work (a ‘sale’ of a particular, predefined task) to an employment relation (where a boss dictates the task after the sale—the relationship at the heart of a firm)? This early work showcased two of Simon’s lasting interests: the complexity of economic relations, where one might sell an obligation that was incompletely described, and the role of uncertainty in changing the nature of decision making. His argument demonstrated the emergence of the ‘boss’. Understanding how contract work turns into employment only implies that we understand a particular relationship between two members of an organization. We have yet to explain the firm as a whole—the Martian’s green fields. What makes a good organization? This is a question for psychologists as much as economists, because we know that incentives that tie individual rewards to the success of the organization appear to have little effect. Simon’s intellectual career can be contrasted with another great economist, Friedrich Hayek, whose ideas we will examine in detail in Unit 11. Both were interested in how societies could thrive in the face of uncertainty and imperfect agents. For Hayek, the price mechanism was all: a device to collect and process vast quantities of information, and so synchronize systems of arbitrary size. But for Simon, the price mechanism needed to be supplemented—even supplanted—by institutions and governments better equipped to handle uncertainty and rapid change. These alternative ‘authority mechanisms’ draw on partially understood aspects of the human psyche: loyalty, group identification, and creative satisfaction. By the time of his death in 2001, Simon had seen many of his ideas reach the mainstream. Behavioural economics has roots in his attempts to build economic theories that reflect empirical data. Simon’s view from Mars shows that economics could not be a self-contained science: an economist needs to be both a mathematician, working with decision-sets and utilities, and a social psychologist, reasoning about the motivations of human relationships. Firms represent a concentration of economic power: This is placed in the hands of the owners and managers, who regularly issue directives with the expectation that their employees will carry them out. An ‘order’ in the firm is a command. Markets are characterized by a decentralization of power: Purchases and sales result from the buyers’ and sellers’ autonomous decision. An ‘order’ in a market is a request for a purchase that can be rejected if the seller pleases. The prices that motivate and constrain people’s actions in a market are the result of the actions of thousands or millions of individuals, not a decision by someone in authority. The idea of private property specifically limits the things a government or anyone else can do with your possessions. In a firm, by contrast, owners or their managers direct the activities of their employees, who may number in the thousands or even millions. The managers of Walmart, the world’s largest retailer, decide on the activities of 2.2 million employees, a larger number of people than any army in world history before the nineteenth century. Walmart is an exceptionally large firm, but it is not exceptional in that it brings together a large number of people who work together in a way coordinated (by the management) to make profits. Figure 6.1 shows a simplified picture of the firm’s actors and decision-making structure. The firm’s actors and its decision making and information structures. Figure 6.1 The firm’s actors and its decision making and information structures. The owners, through their board of directors, decide the long-term strategies of the firm concerning how, what, and where to produce. They then direct the manager(s) to implement these decisions. Figure 6.1a The owners, through their board of directors, decide the long-term strategies of the firm concerning how, what, and where to produce. They then direct the manager(s) to implement these decisions. Each manager assigns workers to the tasks required for these decisions to be implemented, and attempts to ensure that the assignments are carried out. The green arrows represent flows of information. The upward green arrows are dashed lines because workers often know things that managers do not, and managers know things that owners do not. The dashed upward green arrows represent a problem of asymmetric information between levels in the firm’s hierarchy (owners and managers, managers and workers). Since owners or managers do not always know what their subordinates know or do, not all of their directions or commands (grey downward arrows) are necessarily carried out. This relationship between the firm and its employees contrasts with the firm’s relationship to its customers, which we study in the next unit. The bakery firm cannot text its customers to tell them to ‘Show up at 8 a.m. and purchase two loaves of bread at the price of €1 each’. It could tempt its customers with a special offer, but unlike the employer with its employees, it cannot require them to show up. When you buy or sell something, it is generally voluntary. In buying or selling you respond to prices, not orders. The difference between market interactions and relationships within firms is clear when we consider the differing kinds of contracts that form the basis of exchange. A sale contract for a car transfers ownership, meaning that the new owner can now use the car and exclude others from its use. A rental contract on an apartment does not transfer ownership of the apartment (which would include the right to sell it); instead it gives the tenant a limited set of rights over the apartment, including the right to exclude others (including the landlord) from its use. Under a wage labour contract, an employee gives the employer the right to direct him or her to be at work at specific times, and to accept the authority of the employer over the use of his or her time while at work. Contracts for products sold in markets permanently transfer ownership of the good from the seller to the buyer. Contracts for labour temporarily transfer authority over a person’s activities from the employee to the manager or owner. Firms differ from markets in another way: social interactions within firms sometimes extend over decades, or even a lifetime. In markets, we shop around, so our interactions are typically short-lived and not repeated. One of the reasons for this difference is that working in a firm—as either a manager or an employee—means acquiring a network of associates who are essential for the job to be done well. Some of our workmates will become our friends. Managers and employees also acquire both technical and social skills that are specific to the firm they work for. Oliver Williamson, an economist, termed these skills, networks, and friendships relationship-specific or firm-specific assets because they are valuable only while the worker remains employed in a particular firm. When the relationship ends, their value is lost to both sides. Think about how different this is to the social interactions in the market. Although you may know the face or even the name of a person from whom you buy, or to whom you sell something, the relationship is typically temporary, in which case this knowledge has little value. This social aspect becomes important economically when economic changes disrupt social interactions. Imagine how your life as a shopper changes if your local grocery store closes tomorrow. You would have to find a new place to shop, and it might take you a few minutes to learn where the various items you need are on display. Now imagine what would change if the company in which you work goes out of business tomorrow. You would lose your network of work associates, your workplace friendships, and your firm-specific social and technical skills would suddenly have become useless to you. You might have to move to a new town. Your children would need to change school, so they would lose contact with their friends too. Thus, the people making up the firm—owners, managers, and employees—are united in their common interest in the firm’s success, because all of them would suffer if it were to fail. However, they have conflicting interests about how to distribute the profits from the firm’s success amongst themselves (wages, managerial salaries, and owners’ profits), and may disagree about other policies such as conditions of work, managerial perks, and who makes the key decisions—such as whether Apple should assemble iPhones in China or the US. In Figure 6.1 we showed the actors and decision-making structure of a typical firm. How might the actors and decision-making structure of three organizations, Google, Wikipedia, and a family farm compare with this? Draw an organizational structure chart in the style of Figure 6.1 to represent each of these entities. A labour contract transfers ownership of the employee from the employee to the employer. A firm is a structure that involves decentralization of power to the employees. That would be slavery. A labour contract grants the firm the authority to direct the activities of the employee during specific times. The office is not a relation-specific asset, because after the relationship ends another employee can use it, so it still has value to the firm. A labour contract gives the employer the authority to direct the activities of the employee, whereas a sale contract transfers property rights and does not bind the parties to further actions. Firms represent a concentration of economic power in the hands of the owners and managers. The firm’s profits legally belong to the people who own the firm’s assets, which include its capital goods. The owners direct the other members of the firm to take actions that contribute to the firm’s profits. This in turn will increase the value of the firm’s assets, and improve the wealth of the owners. The owners take whatever remains after revenues (the proceeds from sale of the products) are used to pay employees, managers, suppliers, creditors, and taxes. Profit is the residual. It is what’s left of the revenues after these payments. The owners claim it, which is why they are called residual claimants. Managers (unless they are also owners) are not residual claimants. Neither are employees. This division of revenue has an important implication. If the firm’s revenues increase because managers or employees do their job well, the owners will benefit, but the managers and employees will not (unless they receive a promotion, bonus, or salary increase). This is one reason we consider the firm as a stage, one on which not all the actors have the same interests. In small enterprises, the owners are typically also the managers and so are in charge of operational and strategic decisions. As an example, consider a restaurant owned by a sole proprietor, who decides on the menu, hours of operation, marketing strategies, choice of suppliers, and the size and compensation of the workforce. In most cases the owner will try to maximize the profits of the enterprise by providing the kinds of food and ambience that people want, at competitive prices. Unlike Apple, the owner cannot outsource dishwashing or table service to a low-wage location. In large corporations, there are typically many owners. Most of them play no part in the firm’s management. The owners of the firm are the individuals and institutions, such as pension funds, that own the shares issued by the firm. By issuing shares to the general public, a company can raise capital to finance its growth, leaving strategic and operational decisions to a relatively small group of specialized managers. These decisions include what, where, and how to manufacture the firm’s products, or how much to pay employees and managers. The senior management of a firm is also responsible for deciding how much of the firm’s profits are distributed to shareholders in the form of dividends, and how much is retained to finance growth. Of course, the owners benefit from the firm’s growth because they own part of the value of the firm, which increases as the firm grows. When managers decide on the use of other people’s funds, this is referred to as the separation of ownership and control. The separation of ownership and control results in a potential conflict of interest. The decisions of managers affect profits, and profits decide the incomes of the owners. But it is not always in the interest of managers to maximize profits. They may choose to take actions that benefit themselves, at the expense of the owners. Perhaps they will spend as much as possible on their company credit card, or seek to increase their own power and prestige through empire-building, even if that is not in the interests of shareholders. Even single owners of firms are not required to maximize their profits. Restaurant owners can choose menus they personally like, or waiters who are their friends. But unlike managers, when they lose profits as a result, the cost comes directly out of their pocket. Smith had not seen the modern firm, but he understood the problems raised by the separation of ownership and control. There are two ways that owners can incentivize managers to serve their interests. They can structure contracts so that managerial compensation depends on the performance of the company’s share price. Also, the firm’s board of directors, which represents the firm’s shareholders and typically has a substantial share in the firm (like a representative of a pension fund), can monitor the managers’ performance. The board has the authority to dismiss managers, and shareholders in turn have the right to replace members of the board. The owners of large companies with many shareholders rarely exercise this authority, partly because shareholders are a large and diverse group that cannot easily get together to decide something. Occasionally, however, this free-rider problem is overcome and a shareholder with a large stake in a company may lead a shareholder revolt to change or influence senior management. Owners have a strong interest in profit maximization: It is the basis of their wealth. Market competition penalizes or eliminates firms that do not make substantial profits for their owners: We saw this process in Unit 1 and Unit 2 as part of the explanation of the permanent technological revolution, and it applies to all aspects of the firms’ decisions. Which of the following statements about the separation of ownership and control is true? When the ownership and control of a firm is separated, the managers become the residual claimants. Managers always work to maximize the firm’s profit. One way to address the problem associated with the separation of ownership and control is to pay the managers a salary that depends on the performance of the firm’s share price. It is effective for shareholders to monitor the performance of the management, in a firm owned by a large number of shareholders. The shareholders are the residual claimants. Managers may choose to take actions that provide benefits for themselves at the expense of the owners. Such performance-related pay is a common method of incentivizing managers to maximize the value of their firm. When there are many shareholders, there is not only a coordination problem but also a free-rider problem, where every shareholder relies on others to do the costly monitoring (and hence no monitoring is undertaken as a result). The firm does not only manage, as Adam Smith put it, ‘other people’s money’. The decision-makers in a firm decide on the use of other people’s labour too: the effort of their employees. People participate in firms because they can do better if they are part of the firm than if they are not. As in all voluntary economic interactions, there are mutual gains. But just as conflicts arise between owners and managers, there will generally be differences between owners and managers on the one hand, and employees on the other, about how the firm will use the strength, creativity, and other skills of its employees. Our focus here is how firms seek to minimize the cost of acquiring the necessary labour to produce the goods and services they sell. We have already seen in Unit 2 how firms might increase output without raising costs by adopting new technologies, and in Unit 7 we will study their sales decisions. Hiring employees is different from buying other goods and services. When we buy a shirt or pay someone to mow a lawn, it is clear what we get for our cash. If we don’t get it, we don’t pay, but if we have already paid, we can go to court and get our money back. When the firm writes a contract for the employment of a worker, it cannot know exactly what it will need the employee to do, because this will be determined by unforeseen future events. It would be impractical or too costly for the firm to observe exactly how much effort each employee makes in doing the job. Even if the firm somehow acquired this information, it could not be the basis of an enforceable contract. To understand the last point, consider a restaurant owner, who would like her staff to serve customers in a pleasant manner. Imagine how difficult it would be for a court to decide whether the owner can withhold wages from a waiter because he had not smiled often enough. An employment contract omits things that both the employees and the business owner care about: how hard and well the employee will work, and for how long the worker will stay. As a result of this contractual incompleteness, paying the lowest possible wage is almost never the firm’s strategy to minimize the cost of acquiring the labour effort it needs. Think of two or three jobs with which you are familiar, perhaps a teacher, a retail worker, a nurse, or a police officer. In each case, indicate why the employment contract is necessarily incomplete. What important parts of the person’s job—things that the employer would like to see the employee do or not do—cannot be covered in a contract, or if they are, cannot be enforced? Adam Smith, writing at the birth of capitalism in the eighteenth century, was to become its most famous advocate. 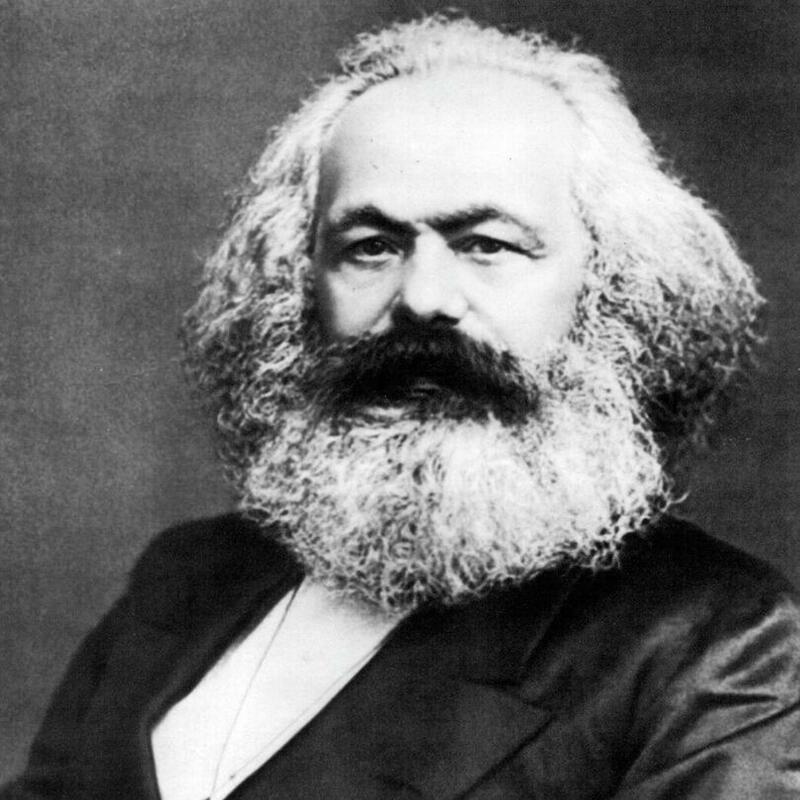 Karl Marx (1818–1883), who watched capitalism mature in the industrial towns of England, was to become its most famous critic. Born in Prussia (now part of Germany), he distinguished himself as a student at a Jesuit high school only by his rebelliousness. In 1842 he became a writer and editor for the Rheinische Zeitung, a liberal newspaper, which was then closed by the government, after which he moved to Paris and met Friedrich Engels, with whom he collaborated in writing The Communist Manifesto (1848). Marx then moved to London in 1849. At first, Marx and his wife Jenny lived in poverty. He earned money by writing about political events in Europe for the New York Tribune. He was the first economist to understand why the capitalist economy was the most dynamic in human history. Perpetual change arose, Marx observed, because capitalists could survive only by introducing new technologies and products, finding ways of lowering costs, and by reinvesting their profits into businesses that would perpetually grow. This, he claimed, inevitably caused conflict between employers and workers. Buying and selling goods in an open market is a transaction between equals: nobody is in a position to order anyone else to buy or sell. In the labour market, in which owners of capital are buyers and workers are the sellers, the appearance of freedom and equality was, to Marx, an illusion. Capital is long and covers many subjects, but you can use a searchable archive to find the passages you need. Marx also had influential views on history, politics, and sociology. He thought that history was decisively shaped by the interactions between scarcity, technological progress, and economic institutions, and that political conflicts arose from conflicts about the distribution of income and the organization of these institutions. He thought that capitalism, by organizing production and allocation in anonymous markets, created atomized individuals instead of integrated communities. In recent years, economists have returned to themes in Marx’s work to help explain economic crises. These themes include the firm as an arena of conflict and of the exercise of power (this unit), the role of technological progress (Unit 1 and Unit 2), and the problems created by inequality (Unit 19). Why is it not possible for firms just to pay employees according to how productive they are? For example, paying employees at a clothing factory $2 for each garment they finish. This method of payment, known as piece rate, provides the employee with an incentive to exert effort, because employees take home more pay if they make more garments. Why do most of today’s firms not use this simple method to induce high effort from their employees? It is very difficult to measure the amount of output an employee is producing in modern knowledge- and service-based economies (think about an office worker, or someone providing home care for an elderly person). Employees rarely work alone, so measuring the contribution of individual workers is difficult (think about a team in a marketing company working on an advertising campaign, or the kitchen staff at a restaurant). If piece rates are not practical, then what other method could a firm use to induce high effort from workers? How could the firm provide an incentive to do the job well, even though the worker is paid for time and not output? Just as the owners of the firm protect their interests by linking management pay to the firm’s share price, the manager uses incentives so that employees will work effectively. Which of the following are reasons why employment contracts are incomplete? The firm cannot contract an employee not to leave. The firm cannot specify every eventuality in a contract. The firm is unable to observe exactly how an employee is fulfilling the contract. It may be costly for the firm if the employee leaves, but employees retain the right to do so. Since the firm does not know all the tasks it will require of an employee, the contract is necessarily incomplete. Since effort or the quality of an individual’s work cannot be perfectly monitored and measured, it cannot be specified in the contract. Employment contracts are usually long-term. An incomplete contract is not one that is unfinished, but rather one that does not completely specify every relevant aspect of the relationship. There are many reasons why people put in a good day’s work. For many people, doing a good job is its own reward, and doing anything else would contradict their work ethic. Even for those not intrinsically motivated to work hard, feelings of responsibility for other employees or for one’s employer may provide strong work motivation. For some employees, hard work is a way to reciprocate a feeling of gratitude to the employer for providing a job with good working conditions. In other cases, firms identify teams of workers whose output is readily measured—for example, the percentage of on-time departures for airline staff—and pay a benefit to the whole group that is divided among team members. But in the background, there is another reason to do a good job: the fear of being fired, or of missing the opportunity to be promoted into a position that has higher pay and greater job security. Laws and practices concerning the termination of employment for cause (that is, because of inadequate or low quality work, not due to insufficient demand for the firm’s product) differ among countries. In some countries, the owners of the firm have the right to fire a worker whenever they choose, while in others, dismissal is difficult and costly. But even in these cases, an employee has to fear the consequences of not working up to the employer’s desired standards. Such a worker, for example, would be unlikely to achieve a position in the firm where she could count on remaining employed when lower demand for the firm’s products results in other workers being dismissed. Do workers care whether they lose their jobs? If firms paid their employees the lowest wages they would be willing to accept, the answer would be no. Such a wage would make the worker indifferent between remaining in the job and losing it. But in practice most workers care very much. There is a difference between the value of the job (taking into account all the benefits and costs it entails) and the value of the next best option—which is being unemployed and having to search for a new job. In other words, there is an employment rent. The employee is more likely to stay with the firm: If she were to quit the job, the firm would need to pay to recruit and train someone else. They can threaten to fire the worker: Owners and managers exert power over employees because the employee has something to lose. The threat can be implicit or explicit, but it will make the worker perform in ways that she would not choose unless this was the case. We can use the same reasoning in the employment of managers by the owners of the firm. The main reason owners wield power over managers is that they can fire them, and so eliminate their managerial employment rents. These examples show the effect of the power that managers and owners exert. This is funny, but not entirely true. For example, the two leading economists of the early nineteenth century—Ricardo and Malthus—were political opponents. Ricardo often sided with businesspeople, for example in supporting freer imports of grain to Britain to reduce food prices and allow lower wages. Malthus opposed him and supported the Corn Laws that restricted grain imports, a position favoured by the landed gentry. But the two economists both proposed the same theory of land rents, which we still use today. Even more striking is that two economists from different centuries and political orientations came up with similar ways of understanding the firm and its employees. When Ronald Coase died in 2013, he was described by Forbes magazine as ‘the greatest of the many great University of Chicago economists’. The motto of Forbes is ‘The capitalist tool’, and the University of Chicago has a reputation as the centre of conservative economic thinking. Recall that Coase had also defined the firm by its political structure: ‘If a workman moves from department Y to department X, he does not go because of a change in prices but because he is ordered to do so.’ He sought to understand why firms exist at all, quoting his contemporary D. H. Robertson’s description of them as ‘islands of conscious power in this ocean of unconscious cooperation’. Both based their thinking on careful empirical observation, and they arrived at a similar understanding of the hierarchy of the firm. They disagreed, however, on the consequences of what they observed: Coase thought that the hierarchy of the firm was a cost-reducing way to do business. Marx thought that the coercive authority of the boss over the worker limited the employee’s freedom. Like Malthus and Ricardo, Coase and Marx disagreed. But like Malthus and Ricardo, they also advanced economics with a common idea. Recall that an economic rent measures the value of a situation—for example, having your current job—compared to what you would get if the current situation were no longer possible. To calculate employment rent—or in other words, the net cost of job loss—we need to weigh up all the benefits and costs of working compared with being unemployed and searching for another job. The disutility of work: Employees must spend time doing things they would prefer not to do. The cost of travelling to work every day. Wage income: This may be partially offset by an unemployment benefit or, in poorer countries, by the possibility of lower-paying self-employment or work on the family farm. Firm-specific assets: These include workplace friends, and perhaps the proximity of the workplace to your present home. Medical insurance: The employer may pay for the employee’s healthcare in some countries. The social status of being employed: In Unit 13 we will see that the stigma of being unemployed is equivalent to a substantial financial cost for most people. Even confining attention to the loss in wages, the cost is high. But how do we measure how high it is? How economists learn from facts How large are employment rents? Setting aside the undoubtedly large but hard-to-measure psychological and social cost of losing one’s job, estimating the cost of job loss (the size of the employment rent) is not simple. Can we compare the economic situation of workers currently employed with the economic situation of unemployed people? No, because the unemployed are a different group of people, with different abilities and skills. Even if they were employed, they would be likely (on average) to earn less than people who currently have jobs. Four years later they were still making $13,300 less than similar workers who had been making the same initial wage, but whose firms did not lay off their workers. In the five years that followed their layoff they lost the equivalent of an entire year’s earnings. Many, of course, did not find work at all. They suffered even greater costs. The year 1982 was not a good time to be looking for work in Pennsylvania, but similar estimates (from the US state of Connecticut between 1993 and 2004 for example) suggest that even in better times, employment rents are large enough that workers would worry about losing them. In which of the following employment situations would the employment rent be high, ceteris paribus? In a job that provides many benefits, such as housing and medical insurance. In an economic boom, when the ratio of job-seekers to vacancies is low. When the worker is paid a high salary because she is a qualified accountant and there is a shortage of accountancy skills. When the worker is paid a high salary because the firm’s customers know and trust her. If the employee loses the job, all these benefits would be lost, so the economic rent from employment is high. The cost of job loss is low, because it would be easy to find another job. Therefore, the economic rent is low. A qualified accountant will be able to find other jobs easily at a similar salary, so the economic rent is low. This worker is paid a high salary because of firm-specific assets that will be lost if she leaves. Other firms would pay a lower salary (at least initially) so the economic rent is high. The pay that she gets: which is something she values. How hard she works: she would like to do no more work than is necessary. Using the concept of utility introduced in Unit 3, we can say that Maria’s utility is increased by the goods and services she can buy with her wage, but reduced by the unpleasantness of going to work and working hard all day—the disutility of work. This is her employment rent per hour. The total employment rent (or cost of job loss), depends on how long she expects to remain unemployed. We will suppose that if she loses her job she can expect to remain unemployed for 44 weeks before finding another. The analysis in Figure 6.2 shows how to calculate the rent. Maria’s employment rent for a given effort and $12 wage in an economy without an unemployment benefit. Figure 6.2 Maria’s employment rent for a given effort and $12 wage in an economy without an unemployment benefit. Maria’s hourly wage, after taxes and other deductions, is $12. Looking ahead from now (taken as time 0), she will continue to receive this wage for the foreseeable future if she keeps her job, indicated by the horizontal line at the top of the figure. Figure 6.2a Maria’s employment rent for a given effort and $12 wage in an economy without an unemployment benefit. Maria’s current effort level is 0.5: she pursues non-work activities for half of the time on the job. Working this hard is equivalent to a cost of $2 per hour to Maria. Figure 6.2b Maria’s employment rent for a given effort and $12 wage in an economy without an unemployment benefit. The difference between her wage and disutility of effort is the economic rent per hour that she receives while employed. 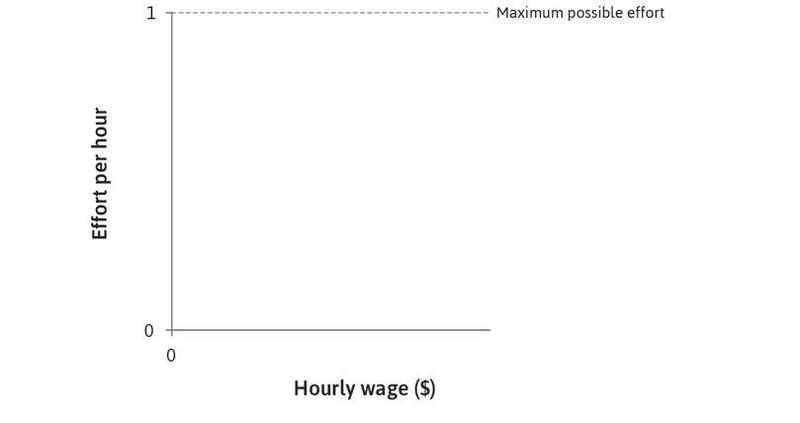 Figure 6.2c Maria’s employment rent for a given effort and $12 wage in an economy without an unemployment benefit. If instead Maria were to lose her job at time 0, she would no longer receive her wages. This unfortunate state would persist as long as she remains unemployed, indicated by the horizontal line at the bottom of the figure. Figure 6.2d Maria’s employment rent for a given effort and $12 wage in an economy without an unemployment benefit. The expected duration of unemployment is 44 weeks, where she would have worked 35 hours per week. That is how long she will remain without pay (and without the disutility of working). 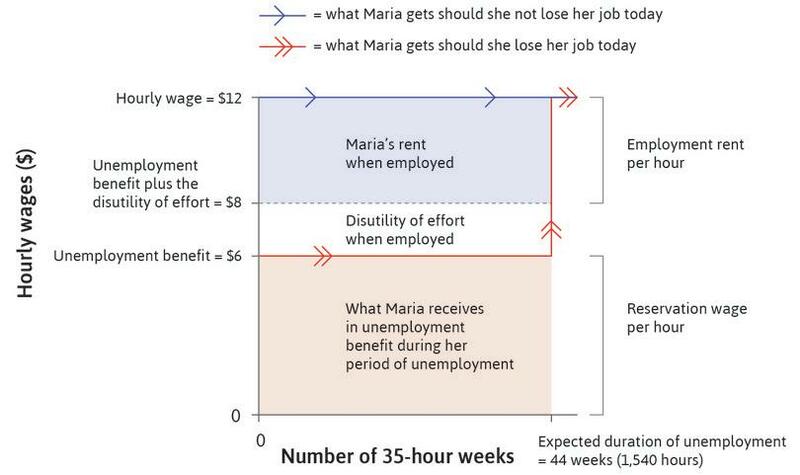 Figure 6.2e Maria’s employment rent for a given effort and $12 wage in an economy without an unemployment benefit. Maria expects to find another job at the same wage after 44 weeks. Figure 6.2f Maria’s employment rent for a given effort and $12 wage in an economy without an unemployment benefit. The shaded area is her total cost of job loss from the spell of unemployment, that is, her employment rent. Figure 6.2g Maria’s employment rent for a given effort and $12 wage in an economy without an unemployment benefit. Her total employment rent is the employment rent per hour times the number of hours of work she will lose if her job is terminated. It is the shaded area in the figure. People who lose their jobs can typically expect help from family and friends while they are out of work. Also, in many economies, people who lose their jobs receive unemployment benefit or financial assistance from the government. In poorer economies, they may be able to earn a small amount in informal self-employment. If Maria receives an unemployment benefit or income from any of these sources, it will partially offset the lost wage income. Let us suppose that while Maria remains unemployed, she will receive a benefit equivalent to being paid $6 an hour for a 35-hour week. This is her reservation wage—it is always available to her, so she would be indifferent between having a job that paid $6 an hour, and not working. In Figure 6.2, without unemployment benefits, her reservation wage was zero. 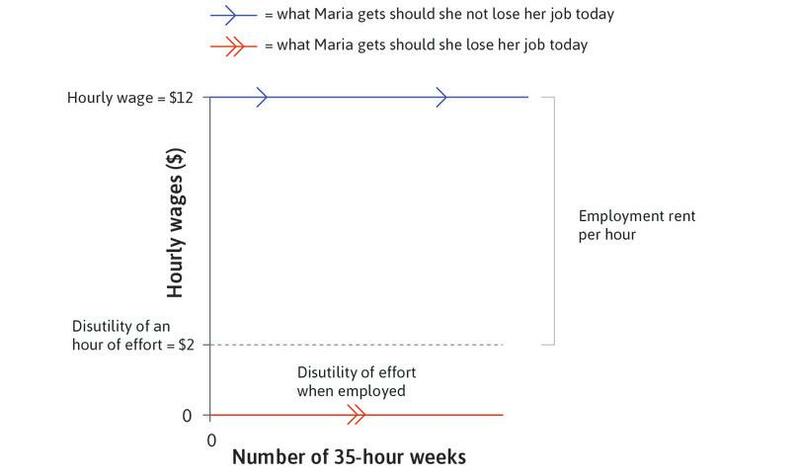 Figure 6.3 shows how this affects Maria’s employment rent, assuming her effort and disutility of work are unchanged. Maria’s employment rent for a given effort and a $12 wage in an economy with an unemployment benefit of $6 of unlimited duration. 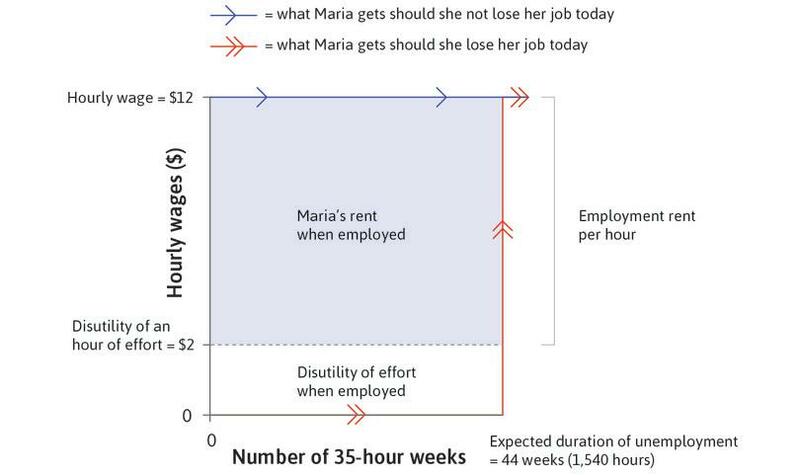 Figure 6.3 Maria’s employment rent for a given effort and a $12 wage in an economy with an unemployment benefit of $6 of unlimited duration. Unemployment benefits usually run out eventually: families and friends will not be able to help forever, and government unemployment benefits are often time-limited. If Maria’s eligibility for unemployment benefits of $6 lasted only for 13 weeks, her reservation wage would not be $6—she would not be indifferent between a job that paid $6 an hour and unemployment. The employment rent would be higher and her reservation wage would be lower, because the average level of benefits she could expect over the 44-week period of unemployment would be much less than $6. Maria finds a job with the same pay after her spell of unemployment. She does not experience any psychological or social costs from being unemployed. Maria can only find a job with the lower pay of $6 per hour after her spell of unemployment. She experiences a psychological cost of being unemployed of $1 per hour. When unemployed, she gains $2 per hour because there is no longer the disutility of working so the net gain is $1. Our next step is to study the social interaction between the employer (who sets the wage knowing that it affects Maria’s employment rent) and Maria herself, whose decision on how hard to work is influenced by the rent. The employment rent per hour is $3. Maria’s reservation wage is $6 per hour. Maria’s employment rent if she can get another job with the same wage rate after 44 weeks of being unemployed is $6,160. Maria’s employment rent if she can only get a job at a lower wage rate after 44 weeks of being unemployed is more than $7,700. Employment rent per hour = wage – unemployment benefit – disutility of effort + disutility of unemployment = 12 – 6 – 2 + 1 = $5. This is the net hourly benefit of being employed compared with unemployment. Maria’s reservation wage = unemployment benefit – disutility of unemployment = 6 – 1 = $5. This is the wage at which Maria is just willing to forgo her unemployment benefits for a job (but it is not enough to make her put in effort!). Maria’s employment rent = $5 (employment rent per hour) × 35 hours per week × 44 weeks = $7,700. If she could get a job at the same wage after 44 weeks, Maria’s employment rent = $5 (employment rent per hour) × 35 hours per week × 44 weeks = $7,700. If the new job would have a lower wage, her employment rent would be higher than $7,700. When the cost of job loss (the employment rent) is large, workers will be willing to work harder in order to reduce the likelihood of losing the job. Holding constant other ways that it might influence the employment rent, a firm can increase the cost of job loss, and therefore the effort exerted by its employees, by raising wages. We now represent this social interaction in the firm as a game played by the owners (through their managers) and the employees. As with other models, we ignore some aspects of their interaction to focus on what is important, following the principle that sometimes we see more by looking at less. The employer chooses a wage: This is based on his knowledge of how employees like Maria respond to higher or lower wages, and informs her that she will be employed in subsequent periods at the same wage—as long as she works hard enough. Maria chooses a level of work effort: This is in response to the wage offered, taking into account the costs of losing her job if she does not provide enough effort. The payoff for the employer is the profit. The greater Maria’s effort, the more goods or services she will produce, and the more profit he will make. Maria’s payoff is her net valuation of the wage she receives, taking into account the effort she has expended. If Maria’s chooses her work effort as a best response to the employer’s offer, and the employer chooses the wage that maximizes his profit given that Maria responds the way she does, their strategies are a Nash equilibrium. Employers typically hire work supervisors and may install surveillance equipment to keep watch on their employees, increasing the likelihood that the management will find out if a worker is not working hard and well. Here we will ignore these extra costs and just assume that the employer occasionally gets some information on how hard or well an employee is working. This is not enough to implement a piece-rate contract, but more than enough to fire a worker if the news is not good. Maria knows that the chance of the employer getting bad news decreases the harder she works. To decide on the wage to set, the employer needs to know how the employee’s work effort will respond to higher wages. So we will consider Maria’s decision first. Maria’s effort can vary between zero and one. We can think of this as the proportion of each hour that she spends working diligently (the rest of the time she is not working). An effort level of 0.5 indicates she is spending half the working day on non-work related activities such as checking Facebook, shopping online, or just staring out of the window. We will assume that Maria’s reservation wage is $6. Even if she put in no work whatsoever (and so endured no disutility of effort, spending all day on Facebook and day-dreaming) her job at a $6 wage would be no better than being without work. So she would not care one way or the other if her job ended. Her best response to a wage of $6 would be zero effort. What if she were paid a higher wage? For Maria, effort has a cost—the disutility of work—and a benefit: it increases the likelihood of her keeping the job, and the employment rent. In her choice of effort she needs to find a balance between these two. A higher wage increases the employment rent and hence the benefit from effort, so it will lead her to choose a higher level of effort. Maria’s best response (the effort she chooses) will increase with the level of the wage chosen by the employer. Maria’s best response to the wage. Point J refers to the information in Figure 6.3 (wage = $12, effort = 0.5 and expected duration of unemployment if she were to lose her job = 44 weeks). Figure 6.4 Maria’s best response to the wage. Point J refers to the information in Figure 6.3 (wage = $12, effort = 0.5 and expected duration of unemployment if she were to lose her job = 44 weeks). Effort per hour, measured on the vertical axis, varies between zero and one. Figure 6.4a Effort per hour, measured on the vertical axis, varies between zero and one. If Maria is paid $6 she does not care if she loses her job because $6 is her reservation wage. This is why she provides no effort at a $6 wage. If she is paid more, she provides more effort. 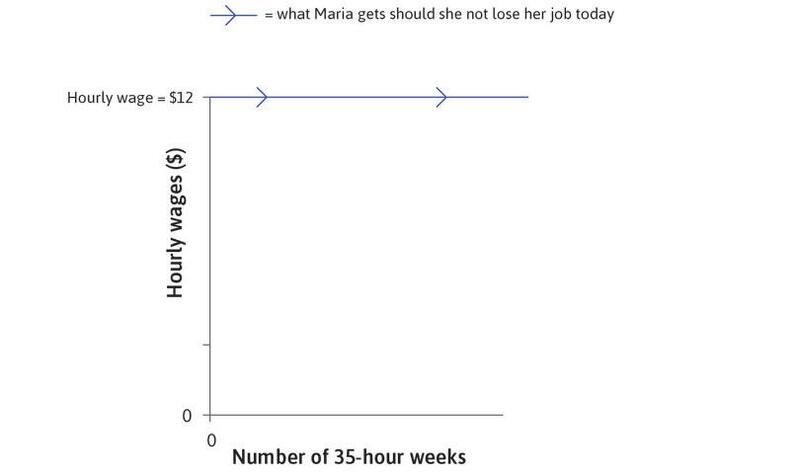 Figure 6.4b If Maria is paid $6 she does not care if she loses her job because $6 is her reservation wage. This is why she provides no effort at a $6 wage. If she is paid more, she provides more effort. The upward-sloping curve shows how much effort she puts in for each value of the hourly wage on the horizontal axis. 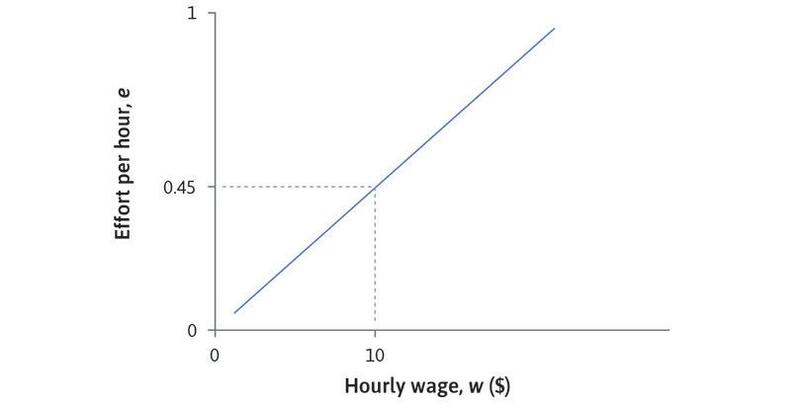 Figure 6.4c The upward-sloping curve shows how much effort she puts in for each value of the hourly wage on the horizontal axis. When the wage is low, the best response curve is steep: a small wage increase raises effort by a substantial amount. 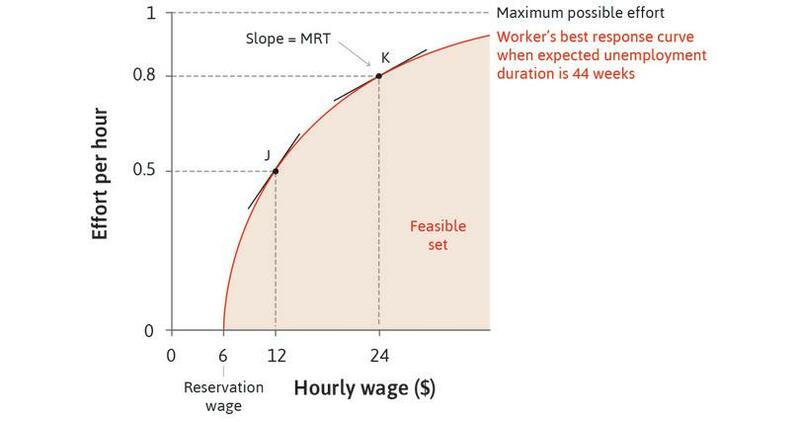 Figure 6.4d When the wage is low, the best response curve is steep: a small wage increase raises effort by a substantial amount. At higher levels of wages, however, increases in wages have a smaller effect on effort. 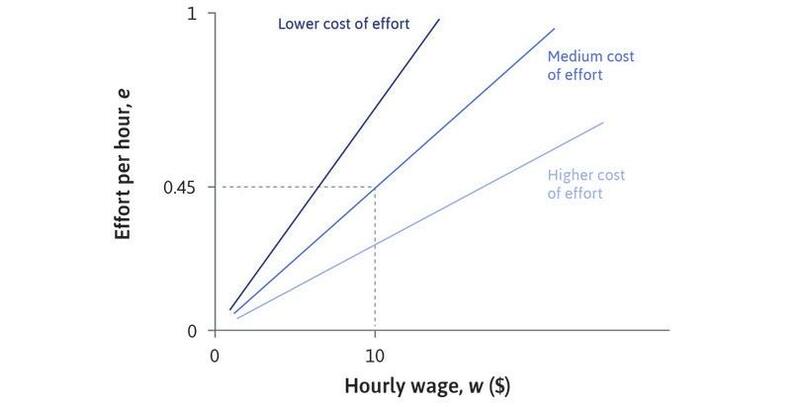 Figure 6.4e At higher levels of wages, however, increases in wages have a smaller effect on effort. The best response curve is the frontier of the employer’s feasible set of combinations of wages and effort that it gets from its employees. 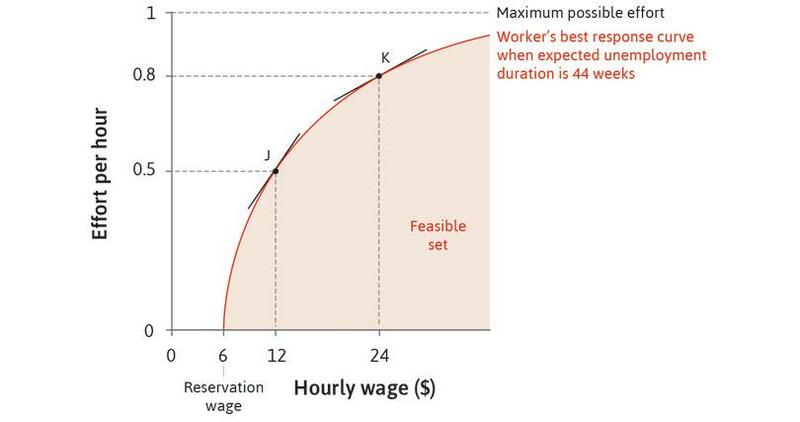 Figure 6.4f The best response curve is the frontier of the employer’s feasible set of combinations of wages and effort that it gets from its employees. The slope of the best response curve is the employer’s marginal rate of transformation of higher wages into more worker effort. Figure 6.4g The slope of the best response curve is the employer’s marginal rate of transformation of higher wages into more worker effort. Point J in Figure 6.4 represents the situation in Figure 6.3 discussed at the end of the previous section. Maria’s reservation wage is $6, she is paid $12, and chooses effort of 0.5. The best response curve is concave. It becomes flatter as the wage and the effort level increase. This is because, as the level of effort approaches the maximum possible level, the disutility of effort becomes greater. In this case it takes a larger employment rent (and hence a higher wage) to get effort from the employee. 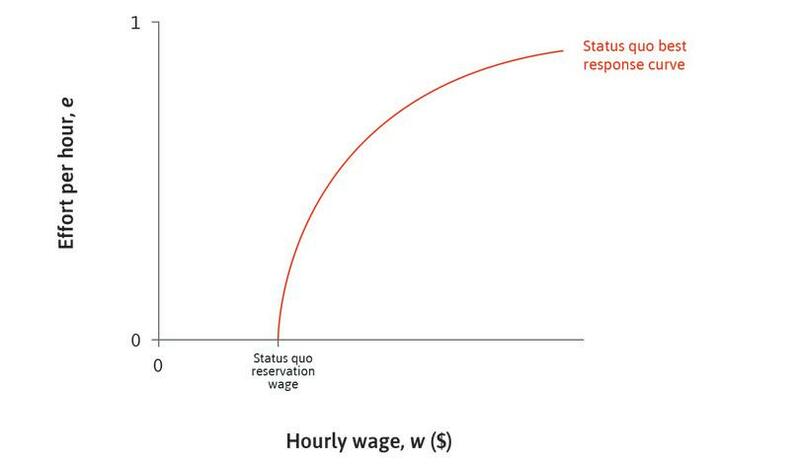 Seen from the standpoint of the owner or the employer, the best response curve shows how paying higher wages can elicit higher effort, but with diminishing marginal returns. In other words, the higher the initial wage, the smaller the increase in effort and output the employer gets from an extra $1 per hour in wages. The best response curve is the frontier of the feasible set of combinations of wages and effort the firm can get from its employees, and the slope of the frontier is the marginal rate of transformation of wages into effort. 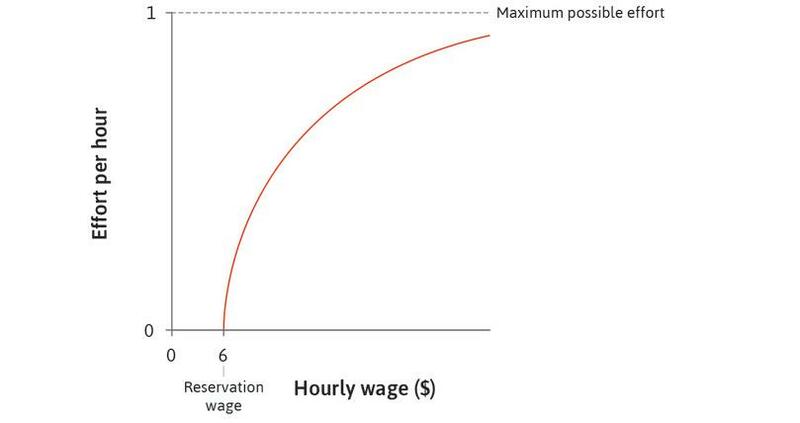 The lowest wage the firm could set for Maria would be the reservation wage, $6, where the best response curve hits the horizontal axis and effort is zero. So we can see that the firm would never offer the lowest wage possible, because she would not work. We have drawn the best response function in Figure 6.4 under the assumption that unemployment is expected to last 44 weeks. If the expected duration were to change, the best response function would change too. If economic conditions worsened, increasing unemployment duration, Maria’s employment rent would be higher. So for any wage, her best response would be to exert a higher level of effort. Figure 6.4 depicted Maria’s best response curve when the expected duration of unemployment was 44 weeks. Which of the following statements is correct? 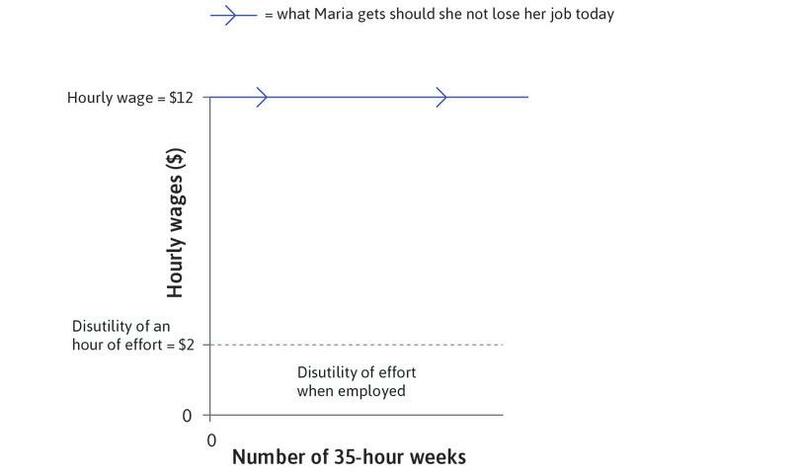 If the expected unemployment duration increased to 50 weeks, Maria’s best response to a wage of $12 would be an effort level above 0.5. If the unemployment benefit was reduced, then Maria’s reservation wage would be higher than $6. Over the range of wages shown in the figure, Maria would never exert the maximum possible effort per hour. Increasing effort from 0.5 to 0.6 requires a bigger wage increase than increasing effort from 0.8 to 0.9. 0.5 is Maria’s best response to a wage of $12 when expected unemployment duration is 44 weeks. If duration increases to 50 weeks, the cost of job loss is higher, so Maria will work harder for the same wage. 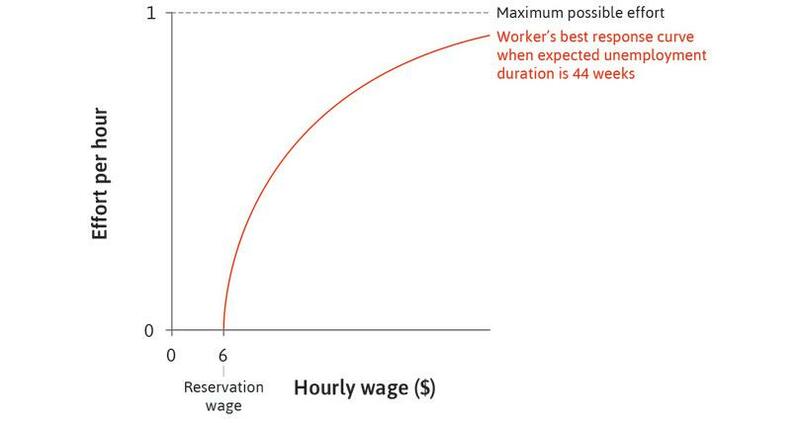 If the unemployment benefit was reduced, then the reservation wage would fall below $6. The maximum level of effort would not be provided over the wage range shown. When effort is lower, a smaller wage rise is required to increase it by 0.1. Maria is not in the situation that Angela faced when Bruno could order her to work at the point of a gun. Maria has bargaining power because she can always walk away—an option that, initially, Angela did not have. Maria chooses how hard she works. The best the owner can do is to determine the conditions under which she makes that choice. The owners and managers know that they cannot get Maria to provide more effort than is given by the best response curve shown in Figure 6.4. The fact that the best response curve slopes upwards means that employers face a trade-off. They can get more effort only by paying higher wages. As we saw in Unit 2, to maximize profits, firms want to minimize the costs of production. In particular, they want to pay the lowest possible price for inputs. A company purchasing oil for use in the production process will look for the supplier that can provide it at the lowest price per litre, or equivalently, supply the most oil per dollar. Likewise, Maria provides an input to production, and her employer would like to purchase it at the lowest price. But this does not mean paying the lowest possible wage. We already know that if he paid the reservation wage, workers might show up (they wouldn’t care one way or the other), but they would not work if they did. The wage, w, is the cost to the employer of an hour of a worker’s time. But what matters for production is not how many hours Maria provides, but how many units of effort: effort is the input to the production process. If Maria chooses to provide 0.5 units of effort per hour, and her hourly wage is w, the cost to the employer of a unit of effort is 2w. In general, if she provides e units of effort per hour, the cost of a unit of effort is w/e. So, to maximize profits, the employer should find a feasible combination of effort and wage that minimizes the cost per unit of effort, w/e. Another way to say the same thing is that the employer should maximize the number of units of effort (sometimes called efficiency units) that he gets per dollar of wage cost, e/w. The upward-sloping straight line in Figure 6.5 joins together a set of points that have the same ratio of effort to wages, e/w. If the wage is $10 per hour and a worker provides 0.45 units of effort per hour, the employer gets 0.045 efficiency units per dollar. Equivalently, a unit of effort costs $10/0.45 = $22.2. The employer would be indifferent between this situation and one in which the wage is $20 with an effort of 0.9—the cost of effort is exactly the same at all points on the line. We will call this an isocost line for effort. Similarly to the isocost lines in Unit 2, these lines join points that have identical effects on the employer’s costs. We can also think of it as an indifference curve for the employer. The employer’s indifference curves: Isocost curves for effort. Figure 6.5 The employer’s indifference curves: Isocost curves for effort. If w = $10 and e = 0.45, e/w = 0.045. At every point on this line the ratio of effort to wages is the same. The cost of a unit of effort is w/e = $22.22. Figure 6.5a If w = $10 and e = 0.45, e/w = 0.045. At every point on this line the ratio of effort to wages is the same. The cost of a unit of effort is w/e = $22.22. The line slopes upward because a higher effort level must be accompanied by a higher wage for the e/w ratio to remain unchanged. The slope is equal to e/w = 0.045, the number of units of effort per dollar. Figure 6.5b The line slopes upward because a higher effort level must be accompanied by a higher wage for the e/w ratio to remain unchanged. The slope is equal to e/w = 0.045, the number of units of effort per dollar. On an isocost line, the slope is e/w, but the cost of effort is w/e. The steeper line has a lower cost of effort, and the flatter line has a higher cost of effort. Figure 6.5c On an isocost line, the slope is e/w, but the cost of effort is w/e. The steeper line has a lower cost of effort, and the flatter line has a higher cost of effort. A steeper line means lower cost of effort and hence higher profits for the employer. On the steepest isocost line he gets 0.7 units of effort for a wage of $10 (at B) so the cost of effort is $10/0.7 = $14.29 per unit. On the middle line he only gets 0.45 units of effort at this wage, so the cost of effort is $22.22, and profits are lower. Figure 6.5d A steeper line means lower cost of effort and hence higher profits for the employer. On the steepest isocost line he gets 0.7 units of effort for a wage of $10 (at B) so the cost of effort is $10/0.7 = $14.29 per unit. On the middle line he only gets 0.45 units of effort at this wage, so the cost of effort is $22.22, and profits are lower. The employer is indifferent between points on an isocost line. Like other indifference curves, the slope of the effort isocost line is the marginal rate of substitution: the rate at which the employer is willing to increase wages to get higher effort. Figure 6.5e The employer is indifferent between points on an isocost line. 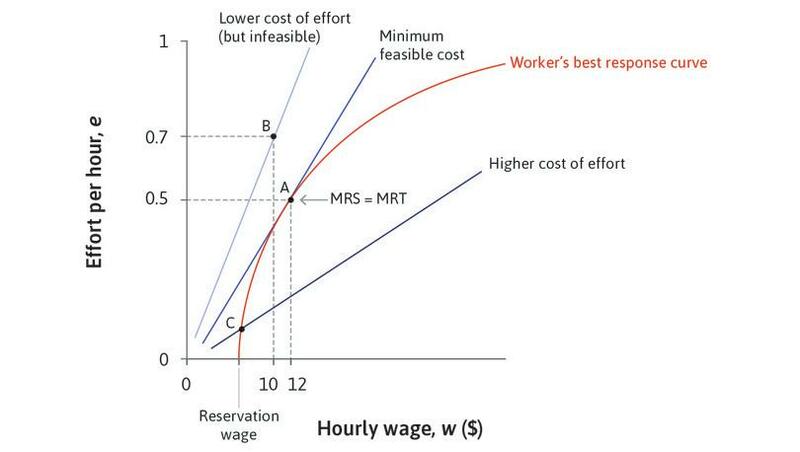 Like other indifference curves, the slope of the effort isocost line is the marginal rate of substitution: the rate at which the employer is willing to increase wages to get higher effort. To minimize costs, the employer will seek to reach the steepest isocost line for effort, where the cost of a unit of effort is lowest. But because he cannot dictate the level of effort, he has to pick some point on Maria’s best response curve. The best he can do is to set the wage at $12 on the isocost line that is tangent to Maria’s best response curve (point A). Use the analysis in Figure 6.6 to see how the employer sets the wage. Figure 6.6 The employer sets the wage to minimize the cost of effort. To maximize profits, the owner wants to obtain effort at the lowest cost. He will seek to get onto the steepest isocost line possible. But because he cannot dictate the level of effort, he has to pick some point on the worker’s best response curve. Figure 6.6a To maximize profits, the owner wants to obtain effort at the lowest cost. He will seek to get onto the steepest isocost line possible. But because he cannot dictate the level of effort, he has to pick some point on the worker’s best response curve. Could this be a point such as C? No. It is clear that by paying more the owner will benefit from a lower wage-effort ratio. Figure 6.6b Could this be a point such as C? No. It is clear that by paying more the owner will benefit from a lower wage-effort ratio. The best he can do is the isocost line that is just touching (tangent to) the worker’s best response curve. Figure 6.6c The best he can do is the isocost line that is just touching (tangent to) the worker’s best response curve. At this point, the marginal rate of substitution (the slope of the isocost line for effort) is equal to the marginal rate of transformation of higher wages into greater effort (the slope of the best response function). Figure 6.6d At this point, the marginal rate of substitution (the slope of the isocost line for effort) is equal to the marginal rate of transformation of higher wages into greater effort (the slope of the best response function). Points on steeper isocosts, such as Point B, would have lower costs for the employer but are infeasible. Figure 6.6e Points on steeper isocosts, such as Point B, would have lower costs for the employer but are infeasible. Therefore $12 is the hourly wage that the employer should set to minimize costs and maximize profits. In Figure 6.6, the employer will choose point A, offering a wage of $12 per hour to hire Maria, who will exert effort of 0.5. The employer cannot do better than this point: any point with lower costs, for example, point B, is infeasible. 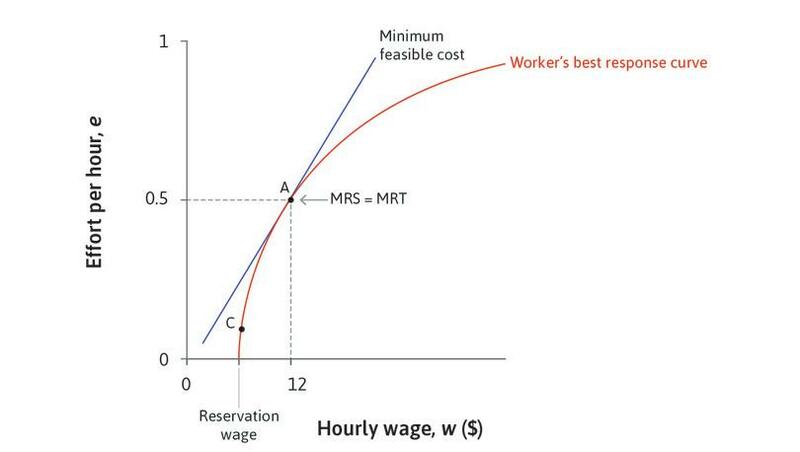 The employer minimizes costs and maximizes profit at the point where his MRS (the slope of his indifference curve or isocost line) equals the MRT (the slope of the best response curve, which is his feasible frontier). He balances the trade-off he is willing to make between wages and effort against the trade-off he is constrained to make by Maria’s response. This is a constrained choice problem, similar to the one in Unit 3. There, individuals maximizing utility chose working hours where MRS = MRT: the slope of their indifference curve equalled the slope of the feasible frontier determined by the production technology. When wages are set by the employer in this manner, they are sometimes called efficiency wages because the employer is recognizing that what matters for profits is e/w, the efficiency units per dollar of wage costs, rather than how much an hour of work costs. What has the labour discipline model told us? Equilibrium: In the owner-employee game, the employer offers a wage and Maria provides a level of effort in response. Their strategies are a Nash equilibrium. Rent: In this allocation Maria provides effort because she receives an employment rent that she might lose if she were to slack off on the job. Power: Because Maria fears losing this economic rent, the employer is able to exercise power over her, getting her to act in ways that she would not do without this threat of job loss. This contributes to the profits of the employer. There must always be involuntary unemployment. Being unemployed involuntarily means not having a job, although you would be willing to work at the wage that other workers like you are receiving. In developing our model we assumed that Maria could expect to be unemployed for 44 weeks before receiving another wage offer at the same level. But the model implies that there must be an extended period of unemployment. To see why, try to imagine an equilibrium in the game between Maria and her employer in which he pays her a wage of $12 per hour, and if she lost her job she could immediately find another at the same wage. In that case, Maria’s employment rent would be zero. She would be indifferent between keeping the job and losing it. So her best response would be an effort level of zero. But this could not be an equilibrium: the employer would not pay $12 an hour to someone who did no work. If it were ever to happen that there were plenty of jobs available in the economy at $12 per hour, and no one was unemployed, such a situation could not last. Employers would offer higher wages to ensure that their workers had something to lose and would therefore work hard. But with higher wages, they would not be able to offer as many jobs. Workers who lost their jobs would no longer be able to find new ones easily. Jobs would be scarce and it might take weeks or months to find another. The economy would have moved to an equilibrium with higher wages and involuntary unemployment. Employees would be earning $16 an hour and those who lost their jobs would be willing to accept another at $16, but they would not immediately be able to find one. In equilibrium, both wages and involuntary unemployment have to be high enough to ensure that there is enough employment rent for workers to put in effort. Unemployment is an important concern for voters and the policymakers who represent them. We can use this model to see how policies that governments pursue to alter the level of unemployment, or to provide income to unemployed workers, will affect the profits of firms and the effort level of their employees. Would any of the following affect Maria’s best response curve or the firm’s isocost lines for effort in Figure 6.6? If so, explain how. The government decides to increase childcare subsidies for working parents but not for those unemployed. Assume Maria has a child and is eligible for the subsidy. Demand for the firm’s output rises as celebrities endorse the good. Improved technology makes Maria’s job easier. Along the isocost line tangent to the best response curve, doubling of the per-hour effort from 0.45 to 0.90 would lead to an increased profit for the firm. The slope of each isocost line is the number of units of effort per dollar. At the equilibrium point, the marginal rate of transformation on the isocost line equals the marginal rate of substitution on the worker’s best response curve. Points C and A both represent Nash equilibria because they are on the best response curve. Along the isocost line, doubling effort requires doubling the wage. The cost of effort would not change, so profit would not change either. Isocost lines have a constant ratio of effort to wage, e/w. Since e is on the vertical axis, and w is on the horizontal axis, the slope is e/w, which is the number of units of effort per dollar. At the equilibrium point, the marginal rate of substitution between higher wage cost and higher effort on the isocost line equals the marginal rate of transformation of higher wages into greater effort on the worker’s best response curve. At point C the worker’s choice of effort is a best response if the employer chooses this wage. But the employer would not be doing the best he could, given the worker’s strategy for choosing effort, so it is not a Nash equilibrium. Until now we have considered how the employer chooses a point on the best response function. But changes in economic conditions or public policies can shift the entire best response function, moving it to the right (or up) or to the left (or down). If there are changes in any of these factors, the best response curve will shift. It reduces the reservation wage: This increases the employment rent per hour. It extends the period of lost work time: This increases total employment rents (the cost of job loss). Figure 6.7 shows the effects on the best response curve of a rise in unemployment, and also of a rise in unemployment benefits. 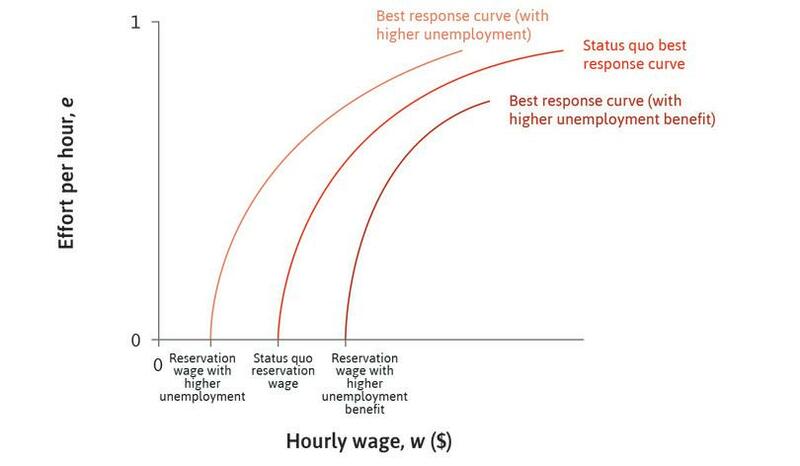 The best response curve depends on the level of unemployment and the unemployment benefit. 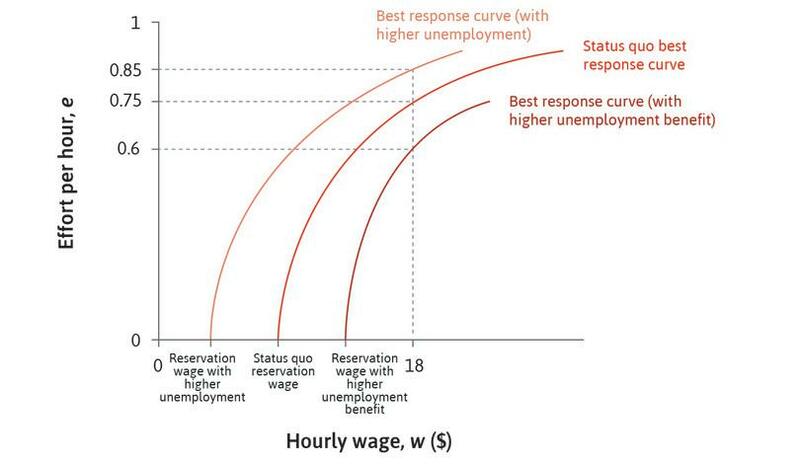 Figure 6.7 The best response curve depends on the level of unemployment and the unemployment benefit. The position of the best response curve depends on the reservation wage. It crosses the horizontal axis at this point. 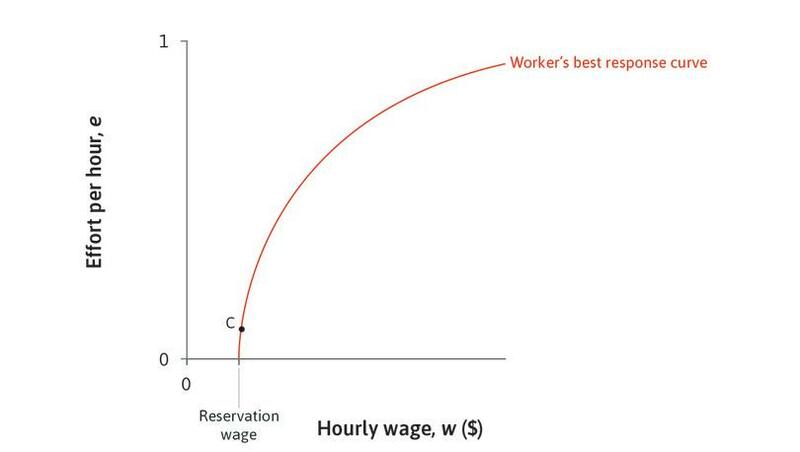 Figure 6.7a The position of the best response curve depends on the reservation wage. It crosses the horizontal axis at this point. 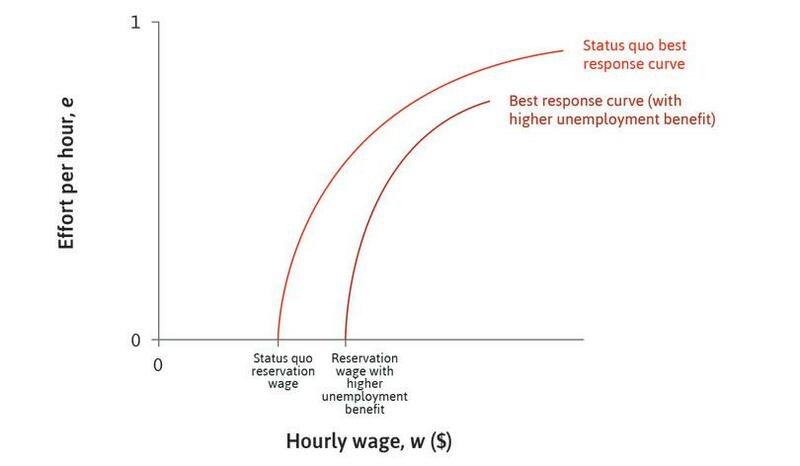 A rise in the unemployment benefit increases the reservation wage and shifts the worker’s best response curve to the right. Figure 6.7b A rise in the unemployment benefit increases the reservation wage and shifts the worker’s best response curve to the right. If unemployment rises, the expected duration of unemployment increases. So the worker’s reservation wage falls and the best response curve shifts to the left. Figure 6.7c If unemployment rises, the expected duration of unemployment increases. So the worker’s reservation wage falls and the best response curve shifts to the left. For a given hourly wage, say $18, workers put in different levels of effort when the levels of unemployment or unemployment benefit change. Figure 6.7d For a given hourly wage, say $18, workers put in different levels of effort when the levels of unemployment or unemployment benefit change. For a given wage, say $18, the amount of effort that the worker will provide increases, improving the profit-making conditions for the employer. The wage that the employer would have to pay to get a given effort level, say 0.6, decreases. A rise in unemployment benefits shifts the best response curve to the right, so it has the opposite effects. Economic policies can alter both the size of the unemployment benefit and the extent of unemployment (and hence the duration of a spell of unemployment). These policies are often controversial. A rightward shift of the employee’s best response function favours employees, who will put in less effort for any given wage, while a leftward shift favours owners, who will acquire the effort of their employees at a lower cost, raising profits. Would effort be higher or lower than 0.6 if the firm did not change the wage? How would the firm change the wage if it wanted to keep the effort level at 0.6? How would the wage change if the firm minimized the cost of effort at the new unemployment level? The idea that employment rents are an incentive for employees to work harder is illustrated in a study by Edward Lazear (an economic advisor to former US President George W. Bush) and his co-authors. They investigated a single firm during the global financial crisis, to see how the managers and workers reacted to the turbulent economic conditions. The firm specializes in technology-based services such as insurance-claims processing, computer-based test grading, and technical call centres, and operates in 12 US states. The nature of the work made it easy for the management of the firm to track the productivity of workers, which is a measure of worker effort. It also allowed Lazear and his colleagues to use the firm’s data from 2006–2010 to analyse the effect on worker productivity of the worst recession since the Great Depression. When unemployment rose, workers could expect a longer spell of unemployment if they lost their job. Firms did not use their increased bargaining power to lower wages as they could have, fearing the reaction of their employees. Our model shows that employers could have cut wages, while sustaining an employment rent sufficient to motivate hard work. An earlier recession provided another insight that helps to explain their reluctance to reduce wages in the crisis. Truman Bewley, an economist, was puzzled when he saw only a handful of firms in the northeast of the US cutting wages during the recession of the early 1990s. Most firms, like the one Lazear’s team studied, did not cut their wages at all. Use the best response diagram to sketch the results found by Lazear and co-authors in their study of a firm during the global financial crisis. Assume that the employer did not adjust wages. Is there a reason why a firm might not cut wages during a recession? Think about the research of Truman Bewley and the experimental evidence about reciprocity in Unit 4. At the start of this unit, we discussed the decision by many clothing companies to outsource production to Bangladesh and other low-wage economies. Show your results in a single diagram. Draw the best response curve of the workers in the high-wage home country in the absence of outsourcing (with the wage on the horizontal axis, and effort on the vertical axis). Show in your diagram what the home country employer will pay home country workers if outsourcing is not possible. Show in your diagram what the home country employer will pay workers in the low-wage country if it switches production there (ignore the costs of moving production). Now assume that outsourcing is possible and is widely practiced by many firms in the clothing industry. Show the best response function for home country workers under these conditions. Explain why this is different from your answer to 1. Show these outcomes in a diagram. If unemployment benefits are increased, the minimum cost of a unit of effort for the employer will rise. If the wage doesn’t change, employees will work harder in periods of high unemployment. If workers continue to receive benefits however long they remained unemployed, an increase in the level of unemployment will have no effect on the best response curve. If an employee’s disutility of effort increases, the reservation wage will rise. An increase in unemployment benefits shifts the best response curve to the right. The employer will no longer be able to reach the isocost line tangent to the original best response curve, so the cost of effort must rise. In periods of high unemployment, the cost of job loss is higher. At any given wage level, employees will choose higher effort to reduce the chance of losing their jobs. In this case, an increase in the level of unemployment would not affect the reservation wage, but it would increase the cost of job loss so the best response curve will change. At the reservation wage, the employee is indifferent between employment and unemployment, and would exert no effort. So a change in the disutility of effort would have no effect. One well-known example of a cooperative is the large British retailer John Lewis Partnership, founded in 1864 and held in trust for its employees since 1950. Every employee is a partner, and employee councils elect five out of seven members of the company board. The benefits for employees (pension, paid holidays, long-service sabbaticals, social activities) are generous, and the business’ profits are shared out as a bonus, calculated as a percentage of each person’s salary every year. The bonus normally ranges between 10% and 20% of pay, even after a significant chunk of the profits are retained for future investment. John Lewis is one of the country’s most profitable and consistently successful retail businesses. Worker-owned cooperatives are hierarchically organized, like conventional firms, but the directives issued from the top of the hierarchy come from people who owe their jobs to the worker-owners. Other than this, the main differences between conventional firms and worker-owned cooperatives are that the cooperatives need fewer supervisors and other management personnel to ensure that the worker-owners work hard and well. Fellow worker-owners will not tolerate a shirking worker because the shirker is reducing the profit share of the other workers. Reduced need for the supervision of workers is among the reasons that worker-owned cooperatives produce at least as much (if not more) per hour than their conventional counterparts. Inequalities in wages and salaries within the company, for example between managers and production workers, are also typically less in worker-owned cooperatives than in conventional firms. And worker-owned cooperatives tend not to lay off workers when the economy goes into recession, offering their worker-owners a kind of insurance (often they cut back on the hours of all workers rather than terminating the employment of some). Case studies show that in those unusual companies owned primarily by the workers themselves, work is done more intensely with less supervision. There have been many attempts to establish other types of business organization throughout recent history, but borrowing the funds to start and sustain worker-owned companies is often difficult because, as we will see in Unit 10, banks are often reluctant to lend funds (except at high interest rates) to people who are not wealthy. Charles Fourier (1772–1837), a philosopher in France, envisioned a utopian world in which people would live in communities of between 1,600 and 1,800 people, called phalanxes. Fourier imagined that members would do all the industrial, craft, and agricultural activity, and would work hard because they did the jobs they liked. Who would clean the sewers and toilets, or put manure on gardens? Fourier suggested giving these jobs to children who love playing with dirt! Dozens of phalanxes existed in the mid-nineteenth century, with more than 40 in the US alone. How do the actors and decision-making structure of John Lewis Partnership differ from that of a typical firm? Redraw Figure 6.1 to show this. 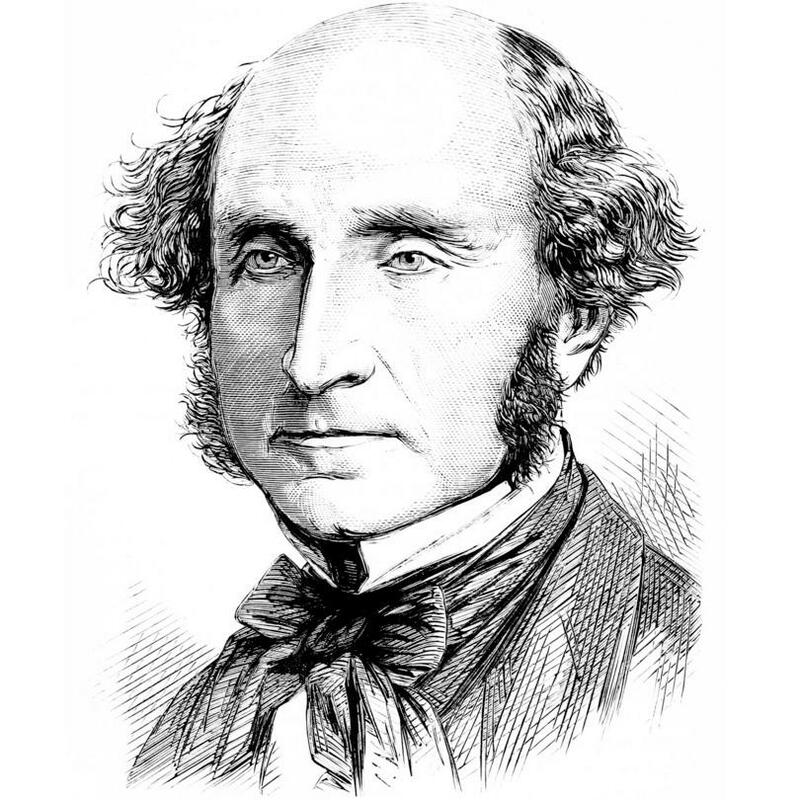 John Stuart Mill (1806–1873) was one of the most important philosophers and economists of the nineteenth century. His book On Liberty (1859) parallels Adam Smith’s Wealth of Nations in advocating limits on governmental powers, and is still an influential argument in favour of individual freedom and privacy. Exercise 6.9 Was Mill wrong? Why do you think Mill’s vision of a post-capitalist economy of worker-owned cooperatives has not yet occurred? In the relationship between Maria and her employer, Maria’s work effort matters to both parties but is not covered by the employment contract. This leads to the existence of employment rents. If they had been able to write a complete contract, the situation would have been quite different. The employer could have offered her an enforceable contract specifying both the wage and the exact level of effort she should provide, and if these terms were acceptable to her, she would have agreed and worked as required. To maximize his profit he would have chosen a contract that was only just acceptable, so she would not have earned any rents. People and banks lend money in return for a promise to repay the full amount plus the stipulated interest. But this may be unenforceable if the borrower is unable to repay. Owners of firms would like managers to maximize the value of the owners’ assets, but managers have their own objectives (first class air travel, lavish offices) and managerial contracts often fall short of an enforceable requirement to maximize the owners’ wealth. The contracts signed by tenants renting apartments may include clauses requiring that they maintain the value of the property. But aside from gross neglect, the liability for not maintaining the property is unenforceable. Insurance contracts require (but typically cannot enforce) that the people who purchase insurance should behave prudently and try not to take risks. Families devote a sizeable fraction of their budgets to purchasing educational and health services, the quality of which is rarely specified in a contract (and would be unenforceable if it were). Parents care for their children with the hope, but no contractual assurance, that their children will reciprocate when the parents are old and unable to work. For these and a great many other exchanges, it appears that Emile Durkheim (1858–1917), the founder of modern sociology, was right when he observed that ‘not everything in the contract is contractual.’ As above, there is usually something that matters to at least one of the parties that cannot be written down in an enforceable contract. Information is not verifiable: For a contract to be enforceable, relevant information must be observable by both parties, but also verifiable by third parties such as courts of law. The court must be able to establish whether or not the requirements of the contract were met. Verifiable information is often unavailable: for example, it may be impossible to prove whether the poor condition of a rented apartment is due to normal wear and tear or the tenant’s negligence. Time and uncertainty: A contract is generally executed over a period of time, for example specifying that Party A does X now and Party B does Y later. But what B should do later may depend on things that are unknown when the contract is written. People are unlikely to be able to anticipate every possible thing that might happen in future—and trying to do so would probably not be cost-effective. Measurement: Many services and goods are inherently difficult to measure or describe precisely enough to be written into a contract. How would the restaurant owner measure how pleasantly his waiters interact with customers? Absence of a judiciary: For some transactions there are no judicial institutions (courts or other relevant third parties) capable of enforcing contracts. Many international transactions are of this type. Preferences: Even where the nature of the goods or services to be exchanged would permit a more complete contract, a less complete contract might be preferred. Intrusive surveillance of workers by employers may backfire if the employer’s distrust angers the workers, leading to less satisfactory work performance. You do not necessarily want to know the exact quality of a concert before you buy the ticket—discovering it may be part of the experience. Many contractual relationships can be modelled in the same way, as a game between two players, whom we call the principal and the agent, who face a conflict of interest. These are known as principal–agent problems. In the case of Maria and her employer, the employer is the principal. He would like to offer Maria, the agent, an employment contract, and she wants the job, but the amount of effort she will provide cannot be specified in the contract because it is not verifiable. This is a problem because there is a conflict of interest: he would prefer her to work hard, whereas Maria prefers an easy life. Our model of Maria’s employment is an example of a general class of principal–agent models, in which an action taken by the agent is ‘hidden’ from the principal, or ‘unobservable’. there is no way that the principal can use an enforceable contract to guarantee that the action is performed. In short: a hidden action problem occurs when there is a conflict of interest between the principal and the agent over some action that may be taken by the agent, and this action cannot be subjected to a complete contract. In these problems, information about the action is either asymmetric (the agent knows what action is taken, but the principal doesn’t) or unverifiable (it cannot be used by a court to enforce a contract). The table in Figure 6.8 identifies the principals and agents in the examples from this section. Figure 6.8 Hidden action problems. Information is verifiable if it can be used in court to enforce a contract. Non-verifiable information, such as hearsay, cannot be used to enforce contracts. Information that is known by one party but not another is asymmetric. We study the banker-borrower principal–agent model in Unit 10. In Unit 12 we will introduce the second main class of principal–agent models, in which it is not the agent’s action that cannot be contracted (hidden action) but rather something about the agent herself that is unknown to the principal (hidden attribute). For each of the following examples, explain who is the principal, who is the agent, and what aspects of their interaction are of interest to each and are not covered by a complete contract. A company hires a security guard to protect its premises at night. A charity wants to commission research to find out as much as possible about a new virus. The products of people’s labour may be transferred to others in markets, or within firms through employment contracts. To understand the role of the firm, we view it not only as an actor, but also a stage on which three sets of actors (owners, managers, and employees) interact. Principal–agent models help us understand how firms work by identifying the consequences of the conflicts of interest between the actors, when these cannot be resolved by complete contracts. Employment contracts are incomplete: they can cover hours and some working conditions, but not the effort provided by the employee, which is not verifiable. So employers set wages that are higher than workers’ reservation wages. Workers receive an employment rent, which motivates them to work hard and deters them from quitting. When all employers set wages in this way, there will be involuntary unemployment in the economy. Public policies such as the provision of unemployment benefits change workers’ reservation wages and best response curves, and so affect the wage-setting process. Lazear, Edward P., Kathryn L. Shaw, and Christopher Stanton. 2016. ‘Making Do with Less: Working Harder during Recessions’. Journal of Labor Economics 34 (S1 Part 2): pp. 333–360. Marx, Karl. 1906. Capital: A Critique of Political Economy. New York, NY: Random House. Marx, Karl. 2010. The Communist Manifesto. London: Arcturus Publishing. Micklethwait, John, and Adrian Wooldridge. 2003. The Company: A Short History of a Revolutionary Idea. New York, NY: Modern Library. Mill, John Stuart. 1994. Principles of Political Economy. New York: Oxford University Press. Mill, John Stuart. 2002. On Liberty. Mineola, NY: Dover Publications. O’Reilly, Tim, and Eric S. Raymond. 2001. The Cathedral & the Bazaar: Musings on Linux and Open Source by an Accidental Revolutionary. Sebastopol, CA: O’Reilly. Pencavel, John. 2002. 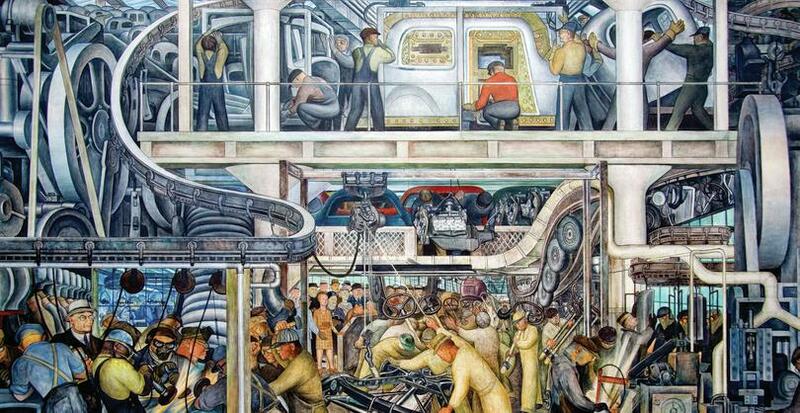 Worker Participation: Lessons from the Worker Co-ops of the Pacific Northwest. New York, NY: Russell Sage Foundation Publications. Simon, Herbert A. 1951. ‘A Formal Theory of the Employment Relationship’. Econometrica 19 (3). Simon, Herbert A. 1991. ‘Organizations and Markets’. Journal of Economic Perspectives 5 (2): pp. 25–44. Toynbee, Polly. 2003. Hard Work: Life in Low-pay Britain. London: Bloomsbury Publishing. Williamson, Oliver E. 1985. The Economic Institutions of Capitalism. New York, NY: Collier Macmillan. These two books describe the property rights, authority structures, and market interactions that characterize the modern capitalist firm. Henry Hansmann. 2000. The Ownership of Enterprise. Cambridge, MA: Belknap Press.